After touch down at Osaka’s Kansai International Airport, we connect direct by train to the JR Tennoji Station, to find ourselves on the doorstep of the renowned Abeno Harukas building of Osaka. 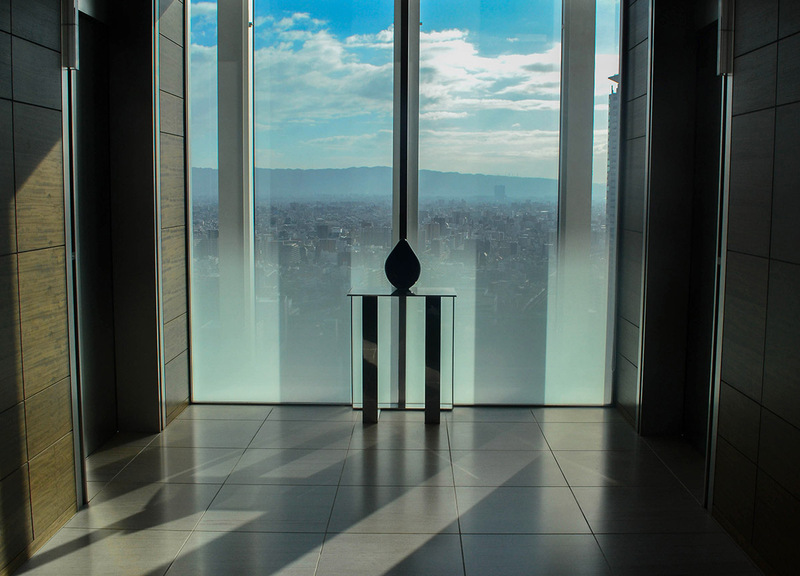 With twelve days of travel and uncertainty ahead, we have decided to make the most of our first days here, with two nights in the iconic Osaka Marriott Miyako hotel, situated on the top floors of the building. The elevator shuttles us to the reception on the 19th floor where we open out to towering spaces and floor to ceiling windows, which overlook the tops of the surrounding highrise skyline. The lobby feels more like a futuristic sci-fi skyport, than any urban city lodgings, yet we are still only a third to the top of the Abeno Harukas building. Famously the tallest building not only in Osaka, but all of Japan. 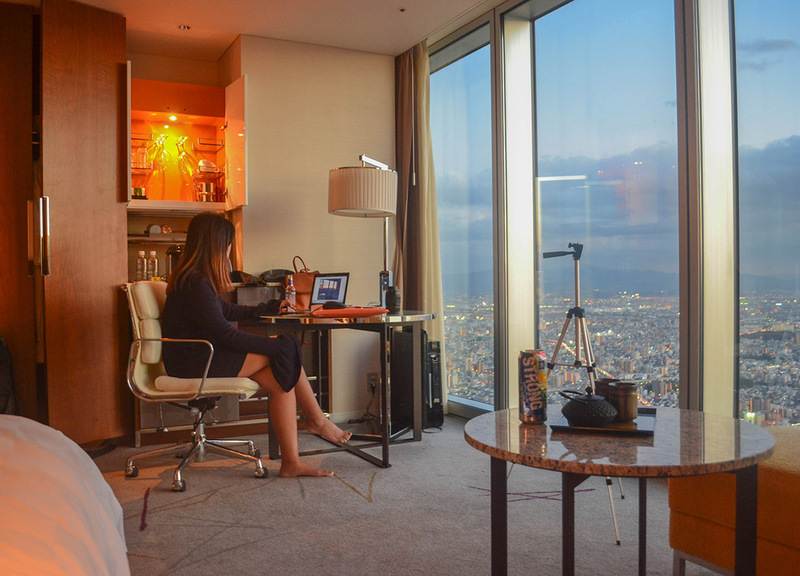 We continue through check-in, before rocketing, in an elevator, to our 53rd floor guestroom suite high above the city. To put the height into perspective, the observation deck, which is one of the main attractions of the city, is found just 7 stories above us, on the 60th floor of the building. And with our stay we are given complimentary tickets to the attraction, although I find the views are very similar to what we have in our own room. Yet they are undoubtedly more relaxed and enjoyable with a bottle of wine and the cloudlike comforts of our 53rd floor guestroom suite. From the moment I left Kansai International Airport I found myself somewhat mesmerized by the city where everything just seems so neat and purposely placed. At times Japan seems almost unreal and I inevitably spend much of my time standing on top of, and looking down on, the circuit board of a city below. It looks more like a model than real life where things are just so neat and orderly, with nothing out-of-place. I would follow the lights of the stairwells in surrounding buildings to find a bulb out-of-place, or at least off colour, but they are all the exact same tone, brightness, lined in perfect symmetry, and without a flicker of imperfection. And this is why Japan has always fascinated me, given I am more used to the opposite, where things are consistently inconsistent where I am from, and half-assed. But even the bumps and blemishes, and wear and tear, look purposely placed in Japan, making it almost hypnotic to look at. It’s like an OCD dream where it feels like just the slightest imperfection would have the whole city grind to a standstill. And in many ways this is how Japan where, if a train for example, were mere minutes late, there would be slight chaos. So the city really is fascinating from above, and I could just watch over it for hours, and do. The hotel, as expected, is centered around the surrounding views, where the lobby, breakfast and bar areas, set on the 19th floor, are just above the surrounding buildings. Then there’s Restaurant ZK, an attraction in itself, which is found on the higher 57th floor, meaning there are varied aspects and views of the city throughout. And it just makes the hotel exciting to explore. But, aside from the views, there are memorable experiences in the smaller details of our stay, like the guestroom toilet which would lift its lid, to welcome me like the tip of a hat, every time I opened the door. It then greets me with a cosy warm heated seat after a winter night out eating in Osaka. Because toilets in Japan are not just toilets, they’re cultural experiences, and while I don’t fully understand the complete workings of the washlet (or robotoilets as I call them) this only adds to the overall excitement of the adventure. This innovation continues as well to the wetroom, which will always be separated from the toilets in Japan, where the bath is automated with a spout timer, so there’s no need to keep watch on it all the time. 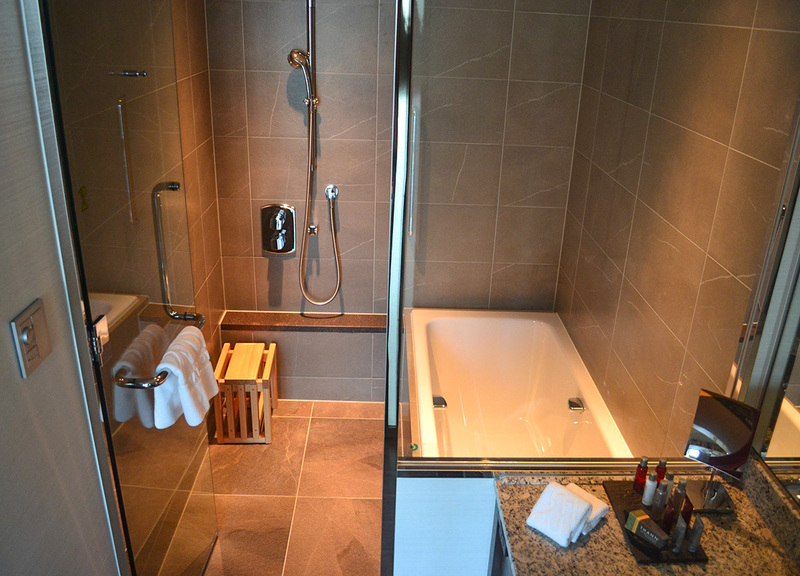 And the wet room just feels more like a spa room, with a massage power shower and Thann aromatherapy soaps and lotions, which are a familiar luxury brand from Thailand. 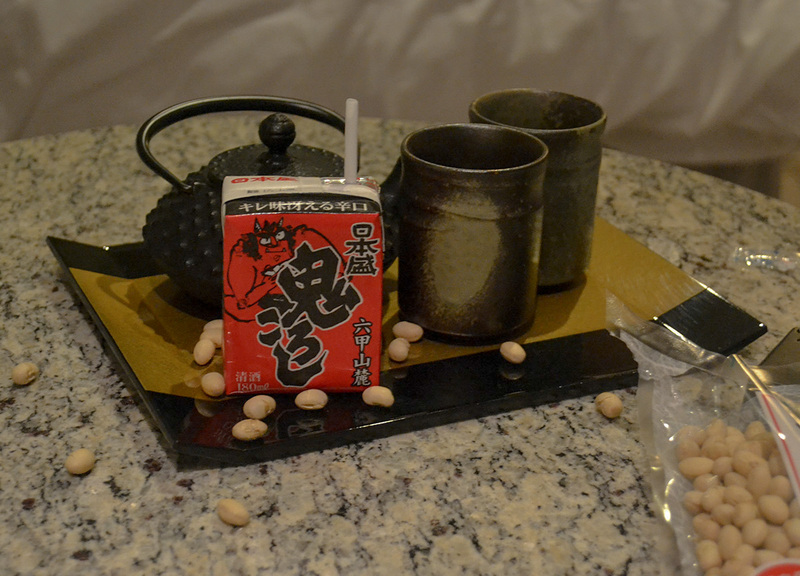 During our stay we also celebrate the Setsubun festival, which is the first day of spring in Japan, and we join along with the traditional tossing of beans at “oni” demons in our guestroom. But given short notice, with no demons to hand, we instead make do with throwing soy beans at cartons of demon sake (Nihon Sakari Oni Koroshi) to cleanse away all the evil of the past year. The one problem with our oasis in the sky, is that it’s just really hard to leave, and with our limited time in the hotel I really just wanted to soak in the bath for an hour or two. But we are fortunately connected almost directly to the subway and JR lines at Tennoji station so travel to and from the hotel is ridiculously easy. This was also our second visit to Osaka where, following our last short encounter, we promised to return to explore more. And inevitably we decided to start and end our travels in Osaka this time around. 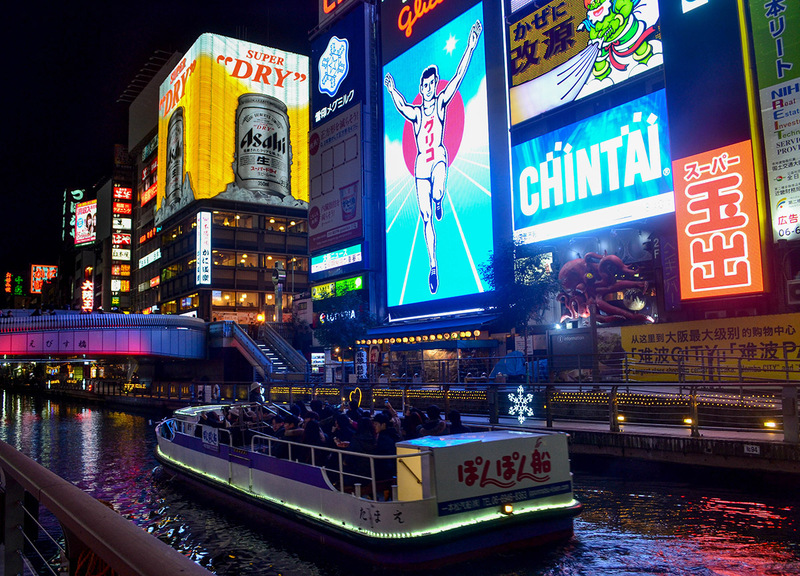 So just a couple of stops in either direction brings us to our main areas of interest in Dontonbori canal (Namba) and Shinsekai with the Tsutenkaku Tower. Both areas just visually fascinating with neon walls and billboards of food and more food. Which again is why we were so desperate to return to Osaka, as the city is often stigmatized by its eating, and its glutton. 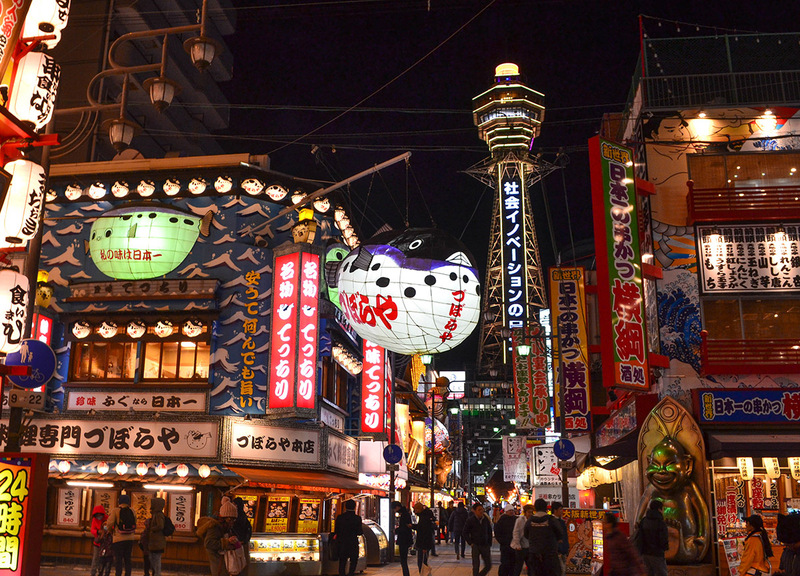 There’s a saying in Japan that “Osaka wa kuidaore” which means “Osaka people eat ’til they drop” and these are our other plans for our stay in the city. There will be full food posts to come but one of the snacks not to be missed in Osaka is tacoyaki, the hugely popular street food snack of octopus dough balls with mixed fillings of tentacles, which originate from Osaka. But with the convenience of location, and the punctuality of the trains, we are easily exploring and back again in no time. This is a beautiful description of the delights of Osaka and of course that surreal hotel you stayed in. Keep up the good work.